First and foremost, what is organic terrace gardening? Well, it is nothing but growing fruits or vegetables or any other plants without using pesticides/chemicals on one’s rooftop of the house. Terrace gardening is picking up in most urban areas of the world as people find less space to grow the plants. Growing vegetables organically is fun and profitable. You can reduce stress levels by getting into gardening activities on the terrace. It not only serves your family, but you can also distribute homegrown organic vegetables to your friends and relatives. In terrace gardening, you will have full control of your garden, especially with daily activities. 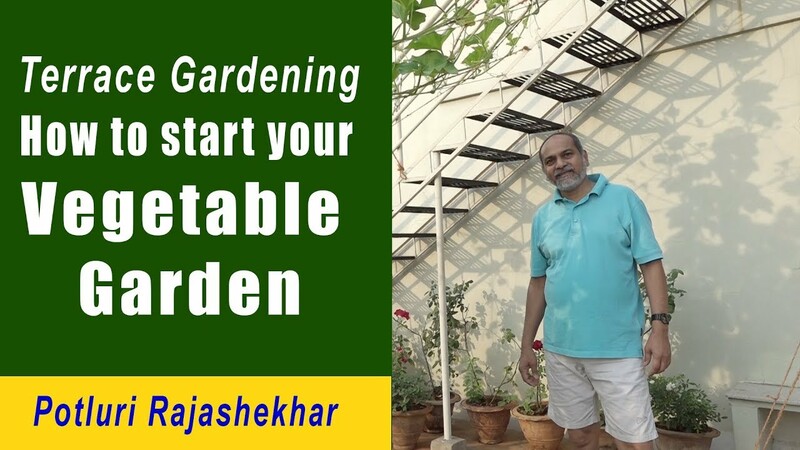 Let us discuss more on benefits of terrace gardening, methods of terrace gardening, how to set up a terrace garden and terrace gardening tips etc. This information can also be used for organic indoor gardening, organic kitchen gardening, organic container gardening, organic balcony gardening, and organic backyard gardening. Before starting to set up a terrace garden, you should be aware of what you are growing organically? According to that, you should make a preparation of the garden. You can grow plants on the terrace with raised beds and containers or pots. You should select a space on the terrace as per your convenience and where you can expect good sunlight. The size of the garden depends on your plan and available space on the terrace. Depending on the space available on the terrace, you should purchase enough containers or pots to set up organic terrace gardening. When growing plants on the terrace, there should be good water facility. Providing an overhead water tank is recommended for easy watering. If the area is a little big, you can adopt a small drip system as well. While growing vegetables/fruits/flowers on the terrace, keep in mind that some of the prefer bright sunlight and some not. To protect the plants from heat stress in summer, you can provide shade nets on the terrace. Providing shade nets are beneficial during rainy season as well. It will prevent from over watering, which can cause root rot diseases. You must secure all required tools or items to maintain your organic terrace garden. You can get gardening kits/tool boxes in stores. You need these tools for regular activities of pruning, trimming or pinching off the leaves and stems. The soil plays a major role in overall organic terrace gardening. Don’t use the soil dug from your surroundings. The soil must have good organic matter to use in the roof garden. The best gardening soils are available in local nurseries and in any garden stores. You can supplement Organic Compost, coco peat into your soil for more nutrients. In case you are planning to grow plants on raised beds, convenient beds should be prepared for planting your vegetables. You can grow seedlings in seed trays and transplant them into containers. You can grow seedlings in places like small cardboard boxes if you are not able to afford for seed trays. Quality and disease resistant organic seeds are more import for your garden. Buy these seeds from certified stores. Don’t buy from online stores as germination percentage would be less. Instead of wasting time with seeds, you can directly buy healthy seedlings for good nurseries and transplant them directly in containers or pots. If you are growing any vines on the terrace, they may need training (support). Provide some tall bamboo sticks for the purpose. Required pruning should be carried out in organic terrace gardening. If you see any weeds in the middle of the containers, remove them as soon as they emerge. There are many terrace farming kits and organic farming kits available in garden stores. The following vegetables can be grown in your organic terrace gardening. Any other short growing plants. Soil should be well mixed with other organic fertilizers before placing the soil in containers. After filling the garden soil in containers, leave them for overnight. If you are planning to direct seeding, plant 2 to 3 seeds in the middle of the containers. You go 2 to 3 inches deep for planting seeds. You can find the planting instructions on the seed pack. Leave the containers for overnight with sown seeds. Next day morning water the containers without disturbing the soil. You should water the containers or raised beds regularly until the seeds start germinating. Avoid overwatering, which can cause the seed rotting. The germination of seeds depends on plants that you are growing. It is required to protect newly erupted seedlings from predators like birds. Provide any shade net for the purpose. This can also prevent extreme sunlight on young seedlings. Depending on the variety, vigor, the plants starts growing within weeks after sowing. You can thin the plants by keeping only one healthy plant in the container (remember, we have sown 2 to 3 seeds). For preventing soil moisture from the container, you can use any mulch material like dry leaves. This can also prevent any weeds growing in container apart from conserving the soil moisture. Later on it decomposes and works as excellent organic compost. Add organic compost for every 10 days to provide more nutrients for healthy growth. Never allow the soil to dry up completely. Watering should be done based on soil moisture. Remove any dead leaves, stems and prune them accordingly. If the soil hardens up, Light raking the soil to loosen around the plant should be carried without damaging roots. Fist water the plants and rake it up. Depending on the vegetable, you can see the flowering and fruiting soon. Happy gardening!. Monitor container plants for following pests in organic terrace gardening. These can be controlled by spraying insecticidal soap. Apply the spray when the sun isn’t directly on the foliage and never spray when temperatures are above 31°C.